Americans voted for as President three times. So there had to be some real-time appeal there that escapes me now, and that's what I hoped to find when I picked this book up. I still don't know how anyone could pull the lever for NIXON over KENNEDY or HUMPHREY. * But I'm shocked by the compassion Thomas engenders for this man. 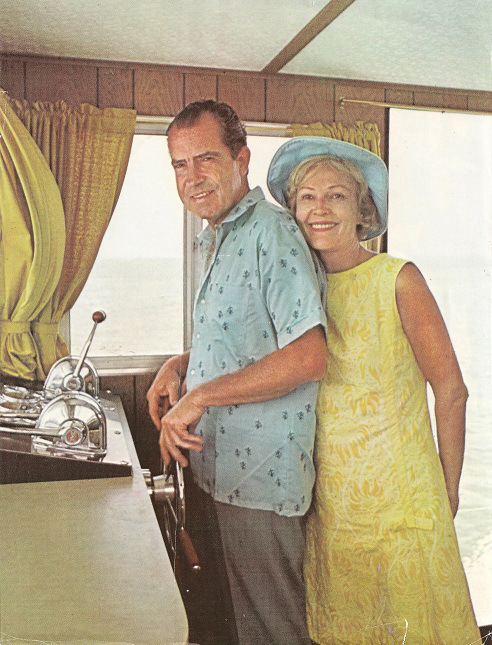 Nixon faced prodigious personal demons -- shyness, paranoia, fear of intimacy -- and he tried to face them down. When he was successful, he accomplished much. But when he failed, it was on a grand, historic scale. Usually when I play WWW.WEDNESDAY, I illustrate it with a photo of JBKO reading. Not this week. Nixon never ever got over his obsession with the Kennedys. He and JFK met very early in their careers, and he liked Kennedy enormously. The Kennedys represented the establishment that shunned him, yet he was as drawn to their charms as everyone else. It was a conflict that bedeviled him to the end of his days. So instead of Jackie, I show Nixon with Pat. Though not always attentive to her, he was always in love with her. And he worked hard at being a good father. 2. What did you just finish reading? Edith Head's Hollywood by Edith Head with Paddy Calistro. I expected Hollywood dish and I got it. Liz Taylor had a beautiful back; Grace Kelly had perfect posture and a penchant for gloves; Redford was shy about disrobing in front of old Edith. But more than that, I learned how a woman coming of age in the 30s could turn herself into a celebrity and a very successful businesswoman. That part of the story was at least as interesting as the movie star stuff. 3. What will you read next? Probably Calico Joe. This Grisham baseball novel was a surprise giftie from my aunt, who knows how I love the national pasttime. *I suppose I get McGOVERN, as much as I personally admired the man.